Get a free and instant report of the food and drinks you supply with our online assessment tool, FoodChecker! Use FoodChecker to find out of the foods and drinks you supply are classified Everyday, Select Carefully, Occasionally, or as confectionery and high sugar content soft drinks according to the the Victorian Government’s School Canteens and Other School Food Services Policy. Whether your school has a canteen, external food service provider or occasional lunch orders, you can assess a whole menu, or assess individual products and recipes. plan a menu that meets the policy (ie, more than 50% of items are from the Everyday category, and there's no Occasionally items, or confectionery and high sugar content soft drinks). When you use FoodChecker you will receive an instant report that you can read on screen or save as a PDF. It contains feedback on every food and drink you supply, and provides tailored recommendations for healthier changes to meet the requirements of the school canteen policy. You can do an assessment anytime, anywhere, on any internet-connected device! "FoodChecker is brilliant and makes assessing recipes so quick and easy." Using FoodChecker to assess and plan your school canteen menus will also help you work towards the Healthy Eating and Oral Health Benchmarks of the Achievement Program. 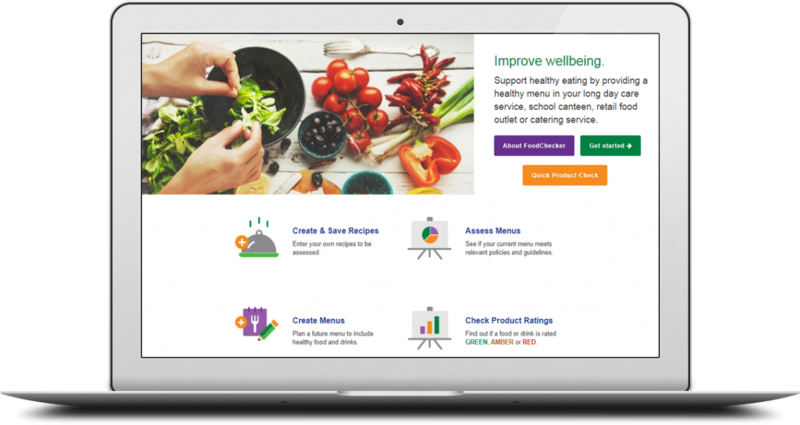 You can use FoodChecker to assess your whole canteen menu, including lunch and recess offerings, recipes made on site, and packaged products. When you make changes to your menu you can reassess it online, or use FoodChecker to plan future menus that meet the policy. Start gathering information about the foods and drinks you want to assess. - a recipe for every food and drink item made on site, with exact quantities for each ingredient (eg, grams, kilograms, litres, etc). - the name and nutrition information for all packaged and pre-made items. You can use FoodChecker to find out if the recipes you prepare on site are classified as Everyday, Select Carefully, Occasionally, or confectionery and high sugar content soft drinks. Your instant report will include the recipe’s classification, plus recommendations on how to make it healthier. You can enter your own recipe, or use the ‘common recipes’ feature to select from hundreds of standard recipes, and modify them to match yours. You can also save your favourite recipes to use in future. You can use FoodChecker to find out if the branded food and drink products supplied in your canteen are classified Everyday, Select Carefully, Occasionally, or confectionery and high sugar content soft drinks. Select from thousands of items already in our database, or enter the details of a new item and save it to your account. Your report will include each product’s classification, with feedback and suggestions for a healthier choice (if relevant).